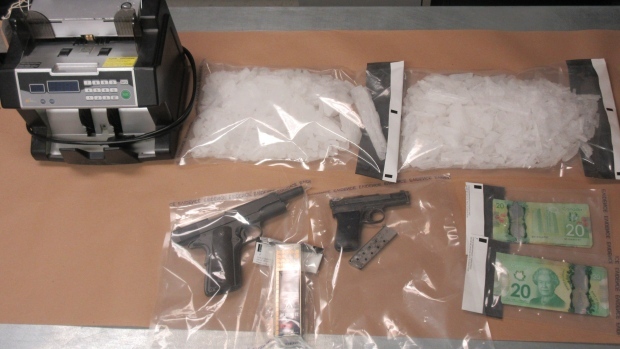 Three people face drug and gun charges after a lengthy investigation that resulted in the seizure of two kilograms of meth. Police seized the drugs and $1,000 cash at a traffic stop near North Battleford on April 9, RCMP say. The Prince Albert Combined Forces Special Enforcement Unit (CFSEU) subsequently executed five search warrants in Prince Albert and area. Officers seized two handguns, ammunition, a money counter, drug trafficking paraphernalia and a large amount of cocaine cutting agent. Maggie Clarke, 22, faces trafficking and weapons charges; Anthony Grant Pederson, 33, faces gun related charges and failing to comply with a recognizance; Kassie Svendsen, 22, faces gun related charges, police say.